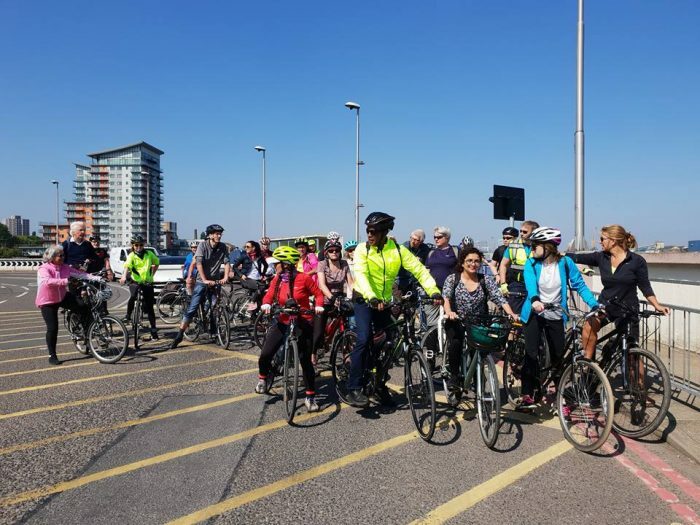 A group 30 in total joined together for this social Healthy Ride + on a gloriously warm and sunny spring day. We started by the Greenwich Foot Tunnel. Ricky kindly went in search of any others who might be waiting on the Northside – Island Gardens, as we had changed the direction of the published route to the original of last year. It works better as we arrive at Cody Dock after a good workout. Headed along the Thames Path, hoping to join onto the supposedly refurbished section of Thames Path at Enderby Wharf, but alas, not finished so we stuck to the diverted route. The temporary section heading towards the Blackwall Tunnel is always worrisome as it often has broken glass afoot but happily this was clear today. At the Thames Barrier the new short cut looked pretty much finished but was, frustratingly, still blocked off. We are going this way again on June by which time it will hopefully be open. Took the Woolwich Ferry over the River Thames and looped around City Airport, going over the Sir Steve Redgrave Bridge. All stopped on the bridge cycle path for a nice view of the airport situated between the King George V and Albert Docks. A sharp left off the bridge, turning dockside and through the university using a designated cycle route. We cut through Beckton Park, getting a bit of shade through the woods approaching the A13 foot bridge. Unfortunately we lost a few riders for a while as the plants and trees turning into Beckton Park obscured the vision of the turn. A good point to note here is that those that were lost stayed put, until Bruce arrived to lead them to the rest of us. We are always very concerned about not leaving riders stranded. A note for me to learn is to wait at this turn. Also maybe pair up riders in a large group so that all can be accounted for easily at all times. 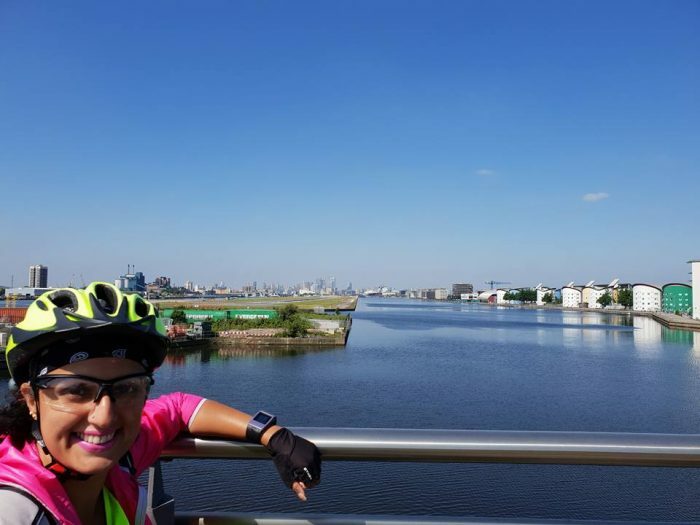 Someone got a puncture at the foot of the A13 bridge, so Bruce and Ricky stayed behind to assist (thank you), whilst the rest of us went on with the route along the Greenway at a slower pace until they had caught up. 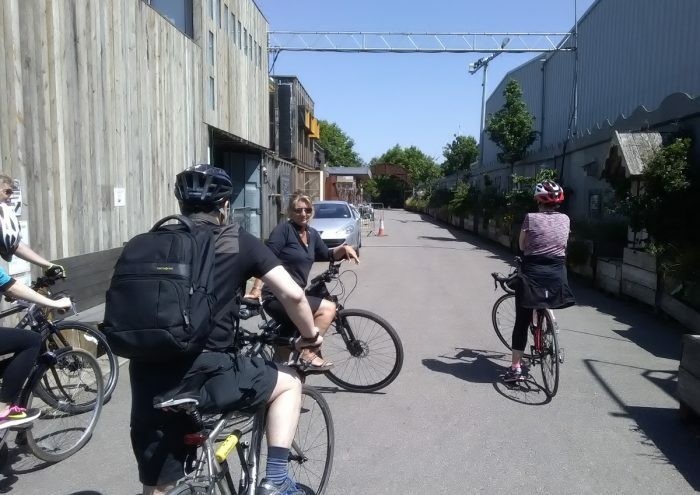 Leaving the Greenway past the working Pumping Station at Abbey Mills Road, we rode along the River Lee towpath to Three Mills (looked stunning in the sunlight with the tide out), from here we continued over TwelveTrees Bridge and along the other side of the river to Cody Dock. 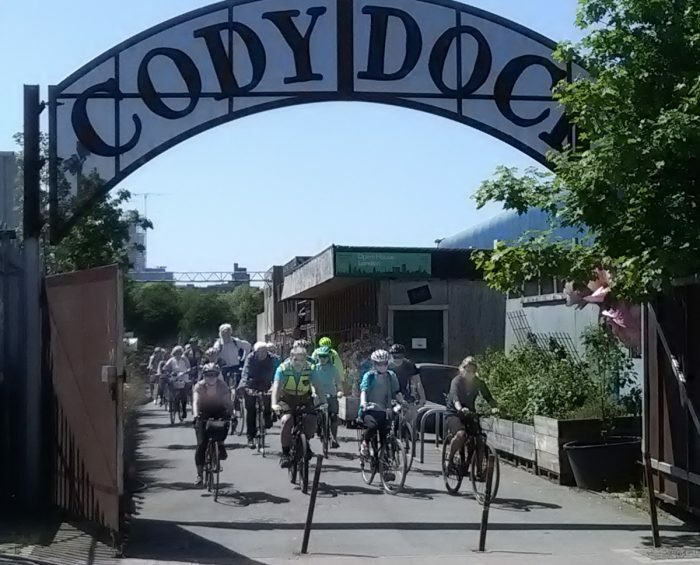 Everyone had a break at Cody Dock and the Café did good business. The beautiful planting was much admired. And we learned that the two large boats that we have seen being repaired on previous visits are due to launch in June. With considerable difficulty we roused riders for the last leg of the ride back to Greenwich. 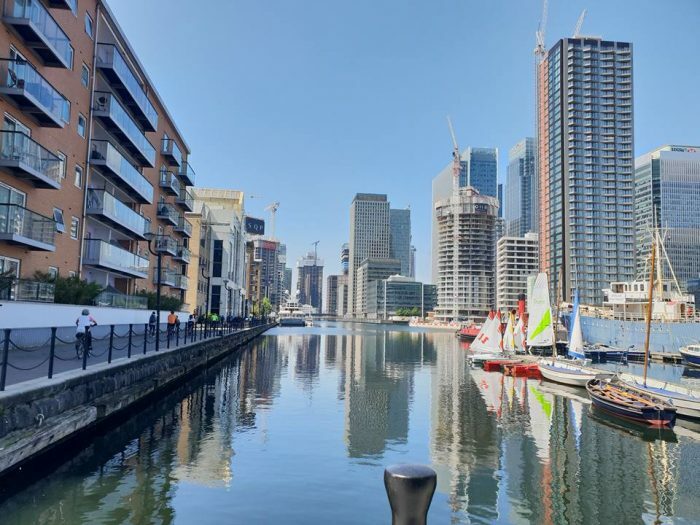 After leaving Cody Dock we took a shortcut along Star Lane, under the A12 to arrive alongside City Island – southeast of Canning Town. From there along Blackwall Way, picking up the cycle path beside the A12. 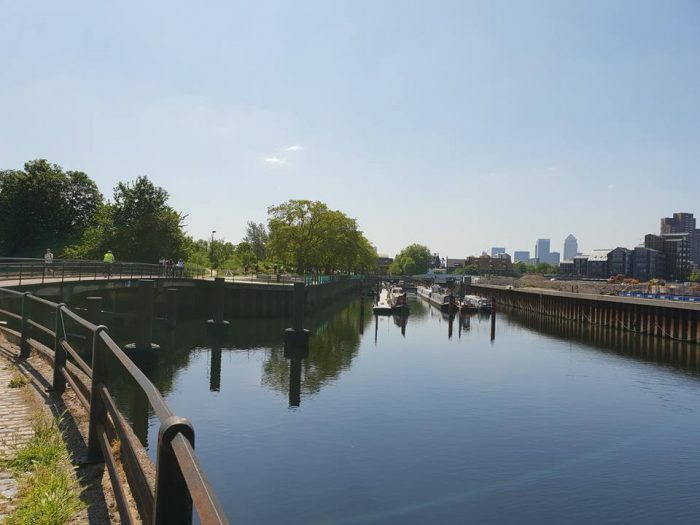 We cycled alongside MIllwall Inner Dock, up onto East Ferry road and across to Millwall Park. Finishing 13 minutes over time in Island Gardens. A really nice healthy ride, with long stretches of cycling where people could chat 3 or 4 abreast. Report by Amanda, edited by Bruce. Photos by Philippa and Bruce.